Crazier Eights is an Uno and Crazy Eights-style card game that's up on Kickstarter now. Crazier Eights is a fantasy card game looking for funding to be manufactured. Have you ever played Crazy Eights or Uno? Crazier Eights is similar to those games insofar as you want to have zero cards in your hand. 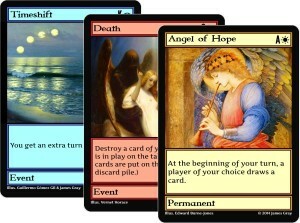 However, every card in Crazier Eights can also be used for an effect. For example, Forbidden Knowledge causes a player to draw three cards, and Devious Dragon destroys characters and castles. To play the game, players take turns drawing one card, playing up to one card for an effect, and discarding up to one card. The Crazier Eights Kickstarter campaign ends on July 5, 2014.